Prior to the “What grade are you in?” question was the usual precedent: “Where does he go to school?” And of course I answered that we homeschool. Then Mr Koda said, “Ah…when you home educate, you also learn.” “Yes!” I beamed. It’s OK if your kid is in “Grade __-ish.” Many homeschoolers can relate to this. Ways of learning differ, interests in certain subjects differ, some lessons and concepts are understood faster than others. That’s OK. Because the key is learning. So if something isn’t quite understood yet, it’s OK to take longer. And if something is already understood, then no need to linger. Learning happens all the time. 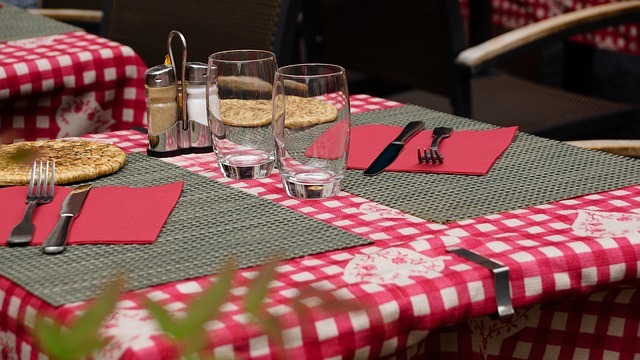 It’s always an enriching experience when you meet someone from a different place. And that knowledge widens your view of the world. I encourage you to notice the many “homeschool moments” you have in your family; you may just be surprised! Have you had a homeschool moment that was a fun experience? Share in the comments. Would love to hear your story! Need homeschool support? Click here. Two brothers began rehearsing their acrobatic act. They jumped, and one landed on the head of another. They jumped again, and the one below now landed on the other’s head. They jumped another time, did a high-five in the air, and landed on the ground with a pose. Then they practiced their tightrope routine, balancing and even jumping, then landing on the rope flawlessly. What an amazing feat! Prior to that, the main performer practiced his magic tricks. He had lots of tricks to wow the crowd, one of which was turning a yellow blanket into a Golden Labrador dog. The magician’s name was Thelé. He was an elephant. That was the end of that playtime, and it looked like this was “To Be Continued.” True enough, yesterday’s playtime was the continuation. We went from contacting the travel agency to acquire passports and to secure visas at the Japanese embassy (including singing and rapping while stuck in traffic in an “Uber” bus), packing and preparing stuff for the trip, checking in at the airport, and boarding the first flight. Whew! It was a whole lot of fun! I was reflecting on this yesterday, and what came to me was FOCUS. I admit, I can easily get distracted by so many things. But I decided years ago, that when I’d have playtime with my kid, I’d be ALL IN. I’d be fully PRESENT — whether it was just 15 minutes or one-and-a-half hours (like yesterday). There were no leaks in terms of attention, no distractions (read: no gadgets! ), just pure enjoyment! Focus is like having this box or block of condensed energy with one purpose — it’s full, complete. It’s got clarity because one’s vision is sharpened. In my playtime example, my son and I had fun because we were both into it. Our purpose was to play. I didn’t have anything else at the back of my mind, shifting my attention and saying, “You gotta do this or that.” It was 100% in. When I learned more about how to focus, I realized it was possible to accomplish those things I had been procrastinating about. Of course, reaching the finish line was such sweet victory, but even gaining momentum and the process itself boosted my happiness! So I encourage, dear friend, to FOCUS. It’s still the first month of the year, and you can decide. 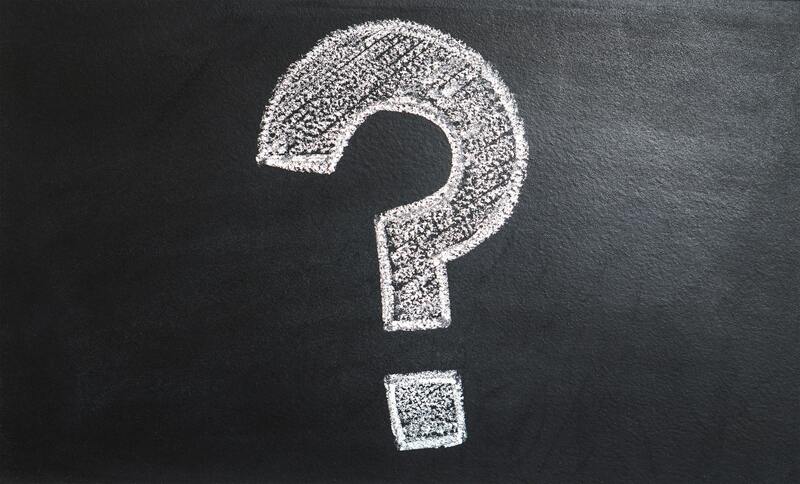 What are the main things you will focus on and improve? Your health? Your relationships? Your walk with God? Then take the necessary, intentional steps. You’ll be surprised at your progress! Hope to see you there, and blessings on your week! >> By the way, my son has a YouTube channel where he posts videos he’s made (of course, I have to approve them first!). Here’s one that he did showcasing some “magic tricks” by the elephant. It’s a new year, a fresh start, a clean slate. There are blank pages waiting to be filled. Ah yes, we can begin again. Let me share with you a practice that we’ve been doing in our community every year. Many of us do this minutes after the clock strikes midnight of the New Year. Others do it later in the day of January 1, or any time in January. So what we do is we pray for God’s message for us for the year. With Bible in hand, we say a prayer for God to lead us to the page or pages where His message is for us, to lead our eyes and finger as we open the Bible. As we sense God’s peace in our hearts, we prayerfully open the Bible and point to a page. Then we begin to read the words. And if something strikes us or touches us, we stop and reflect. Sometimes, the message is an instruction to be obeyed. Other times, it is a promise to claim and receive. At still other times, it might even be a warning of what to avoid. But always it is an encouragement and assurance that God actually cares to communicate with us. More often than not, understanding it will not come in one go; it is a process of discovering more and more the treasures that are in that particular passage. Go ahead and try it out! To declutter means to “remove things you do not need in a place, in order to make it more pleasant and more useful” (Cambridge Dictionary). It’s to remove what’s unnecessary or doesn’t serve a purpose anymore. I propose we declutter, not just externally, but also internally. Externally has to do with physical spaces. So I started decluttering our room some days ago, and it felt so good! Such happiness to finally see more areas without stuff! It’s like there was more room to breathe. I am not done decluttering, but just starting and seeing some progress already helps in welcoming new possibilities! As for internal decluttering, this has to do with letting go of such things as mental baggage and negative attitudes. I remember sometime ago when I was tempted to replay some negative memories in my mind, I would tell myself, “Don’t go there.” Because I knew that if I did, it would only stir up the same negative feelings, and possibly I could begin to think bad of others. So that’s never a good idea. Best is to cut off all that negative weight to have a fresh start. Ergo, a goal gives us direction, so that we don’t allow life to “just happen.” Consequently, goals help us become intentional. Of course, it also implies that effort has to be exerted. And that’s how goals position us for growth. The painstaking process of going from point A to point B is a victory. Each little step forward is a win in itself. So go ahead and welcome all things new, and position yourself for an exciting year! You might also want to watch the replay of a short video I did entitled, “Designed for newness — some thoughts on Isaiah 43:19, “See, I am doing a new thing!” Click here to watch it. Many people start the new year with “New Year’s Resolutions,” and it’s all good. It shows that people want to live better lives. Unfortunately, many are not able to follow through. After a few weeks, they either give up or forget about their resolutions altogether. 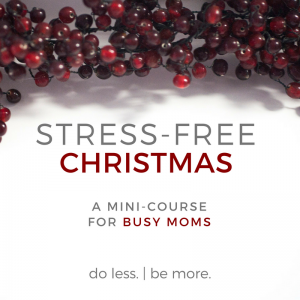 I know for us busy moms, we, too, like a fresh start. We might already have our goals in place, or maybe we’re still in the process of formulating them. But I’m sure we’d all want some support to help us follow through on these resolutions and goals. Which is why I’d like to help you at the start of this year to help you gain momentum so you can follow through, and not just set goals, but to actually achieve them. 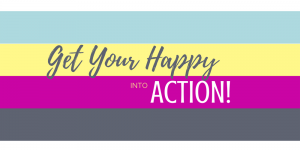 Get Your Happy into Action! is a 4-week 1:1 coaching program for moms who need support in following through on their goals. The aim is not just to set goals, but to position oneself to actually achieve them. 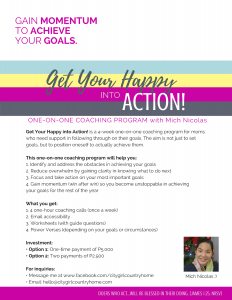 So if you’d like to be one of those who get personalized support from me with regard to taking action on your most important goals at the start of this year, then I invite you to sign up for this program. The investment in yourself will truly be worth it. And I would love to serve you and help you on your journey. If you’re ready to take up your “mission challenge” to finally believe what’s possible and take action towards the goals God has put in your heart at the start of this year, then click here to avail of the one-time payment. 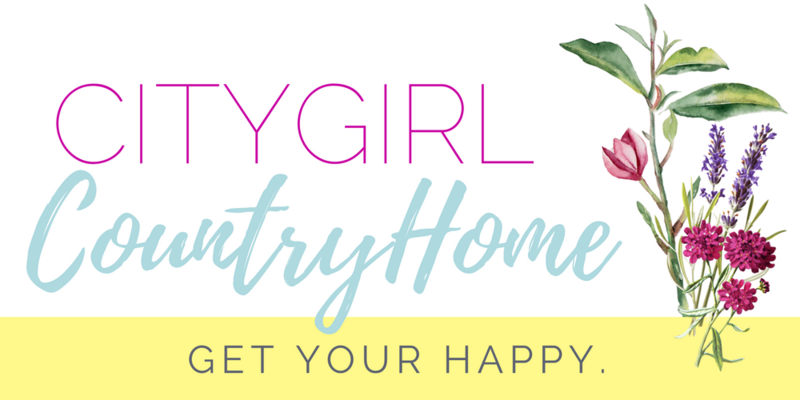 If you’d rather do the 2-payment option, then email me at hello@citygirlcountryhome.com so I can give you further details on the payment process. Feel free to email me if you have any questions or concerns as well. I look forward to working with you and helping you gain momentum towards achieving your goals! To new and exciting things this 2018!